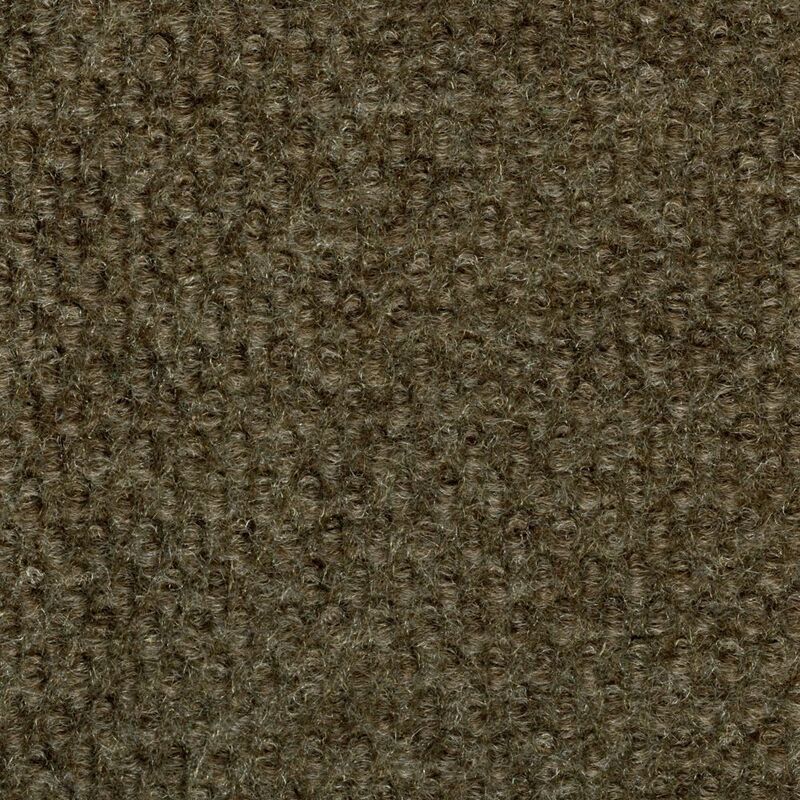 These carpet tiles are the best choice if you want a fashion forward, textured look at a great price for your home. Used as an area rug, hallway runner or wall to wall, this tile provides a solution that does not require an installer or a separate adhesive. You can create a new look in an afternoon with this peel and stick system. The 18-inch x 18-inch tiles are cut with the 'perfect cut' system, which ensures easy installation for a beautiful floor. The only tools you will need to install are a measuring tape, chalk line, utility knife with a sharp blade and a contractor square. Easily maintained by vacuuming or sweeping. In the event of a stubborn stain or damaged tile, simply replace the tile with a new one. This lightweight, low profile, unpadded tile can be used in basements, porches, exercise rooms, workrooms, and even outdoors. The soft to the touch tiles are made from 100% Eco-Fi recycled polyester so you can be comfy and stylish while still being environmentally responsible. Coordinating accent tiles are available in additional colours allowing you to customize your space to reflect your personality and lifestyle. The Traffic Master Green space Carpet Tile, which resembles the look of a putting green, will allow you to create a fun environment in your recreational room, exercise room, porch, or workroom. This tile can even be used outdoors. An installer and separate adhesives are not needed! You can easily create a new look in an afternoon with this peel & stick system. The 18 in.x 18 in. tiles are cut with the "perfect cut" system, which ensures easy installation for a beautiful floor. The only tools you will need to install are a measuring tape, chalk line, utility knife with a sharp blade and a contractor square. This lightweight, low profile, unpadded tile is very easily maintained by vacuuming or sweeping. In the event of a stubborn stain or damaged tile, simply replace the tile with a new one. These soft-to-the-touch tiles are made from 100% Eco-Fi recycled polyester allowing you to be comfy & stylish while still being environmentally responsible. These carpet tiles are the best choice if you want a fashion forward, textured look at a great price for your higher traffic areas in your home. Used as an area rug, hallway runner or wall to wall, this tile provides a solution that does not require an installer or a separate adhesive. You can create a new look in an afternoon with this peel and stick system. The 18 in. x 18 in. tiles are cut with the "perfect cut" system, which ensures easy installation for a beautiful floor. The only tools you will need to install are a measuring tape, chalk line, utility knife with a sharp blade and a contractor square. Easily maintained by vacuuming or sweeping. In the event of a stubborn stain or damaged tile, simply replace the tile with a new one. This medium weight, unpadded tile can be used in basements, porches, exercise rooms, workrooms, and even outdoors. Hobnail Espresso Texture 18-inch x 18-inch Indoor and Outdoor Carpet Tile (36 sq. ft./case) These carpet tiles are the best choice if you want a fashion forward, textured look at a great price for your home. Used as an area rug, hallway runner or wall to wall, this tile provides a solution that does not require an installer or a separate adhesive. You can create a new look in an afternoon with this peel and stick system. The 18-inch x 18-inch tiles are cut with the 'perfect cut' system, which ensures easy installation for a beautiful floor. The only tools you will need to install are a measuring tape, chalk line, utility knife with a sharp blade and a contractor square. Easily maintained by vacuuming or sweeping. In the event of a stubborn stain or damaged tile, simply replace the tile with a new one. This lightweight, low profile, unpadded tile can be used in basements, porches, exercise rooms, workrooms, and even outdoors. The soft to the touch tiles are made from 100% Eco-Fi recycled polyester so you can be comfy and stylish while still being environmentally responsible. Coordinating accent tiles are available in additional colours allowing you to customize your space to reflect your personality and lifestyle. Hobnail Espresso Texture 18-inch x 18-inch Indoor and Outdoor Carpet Tile (36 sq. ft./case) is rated 4.1 out of 5 by 52. Rated 5 out of 5 by Kali from These are high quality, easy to use carpet tiles. We... These are high quality, easy to use carpet tiles. We had to carpet our kitchen in a house we are moving into because the tiles are old and crumbling. This definitely served its purpose. Thank you! Rated 4 out of 5 by Donald from carpet is good.I used it in the laundry room.... carpet is good.I used it in the laundry room. Rated 1 out of 5 by Ed from Ordered two boxes of the brown espresso. Both have the same color and dye lot listed. However, th... Ordered two boxes of the brown espresso. Both have the same color and dye lot listed. However, they are completely different colors. One is visibly darker than the other. Both boxes are going back. If you order multiple boxes, make sure to check each for color accuracy before beginning to put the tiles down. Rated 1 out of 5 by VJ from DO NOT BUY THIS PRODUCT. IT IS A NON-RETURNABLE ITEM! At least I got a store credit. I have looked all over this product's page and I cannot find anywhere that it says "non-returnable". AGAIN, IT IS AN ABSOLUTELY TERRIBLE PRODUCT. DO NOT BUY! Rated 1 out of 5 by Slatton from Very thin, very light, very cheap. Very thin. You can see right through them. When they were delivered, I thought "Oh, just 4 boxes?" Then I picked up the boxes and they were incredibly light. When I opened the boxes I was very disappointed. I returned them to the store. These are not recommended for installation where people might WALK. There's a 3 Star review on here that details my fears. The price may be good, but it's not a good deal by any stretch. Rated 4 out of 5 by Dudley from Great for lanai Instead of replacing the indoor/outdoor carpet on my lanai with rolled carpet as I have done twice previously, I decided to try carpet tiles. Delivered to the house and so much easier to install. No need to have a friend with truck pickup and then help carry and maneuver on lanai. Also much easier to trim an individual piece with scissors than crawling around with a carpet knife. The pieces adhered well to the painted concrete floor. Yes the pieces are lightweight and kind of see through, but look fine once on the floor. It feels no different underfoot than the rolled carpet. When a section gets ruined from rain or dogs, I have left over pieces that I can replace with instead of the whole carpet. Only time will tell how well the carpet tiles hold up. While I wouldn't put these in my house, they are a good choice for the lanai. Rated 4 out of 5 by idgie57 from Good choice for fast & easy carpet install We bought these to replace old carpeting in my mother's room. She's a wheelchair/walker user, so time will tell how long they hold up with that kind of traffic. Installation couldn't have been easier - we snapped a chalk line and started the layout exactly as specified in the instructions, cutting the edge tiles with a scissors. Took all day (we are frequent break-takers) but the results were great. We placed them on top of 27-year old particle board floors that were starting to shed, but I kept my vacuum cleaner nearby and vacuumed each area with the soft brush attachment before laying each tile. They adhered without a problem and none of them have lifted yet, even with Mom scuffing her feet. If you're looking for a padded tile, these won't do for you. While these aren't padded, they are very light weight, easy to work with and comfortable enough underfoot. Be sure to lay them as directed with the 1/4 turn rotation - it gives a nice, subtle "checkerboard" effect. All in all, they're definitely worth a try if you're looking for a quick, easy floor covering that won't break the bank when you buy it and won't break your back when you put it in. Much easier than wrestling with roll carpeting in a room that's not square!